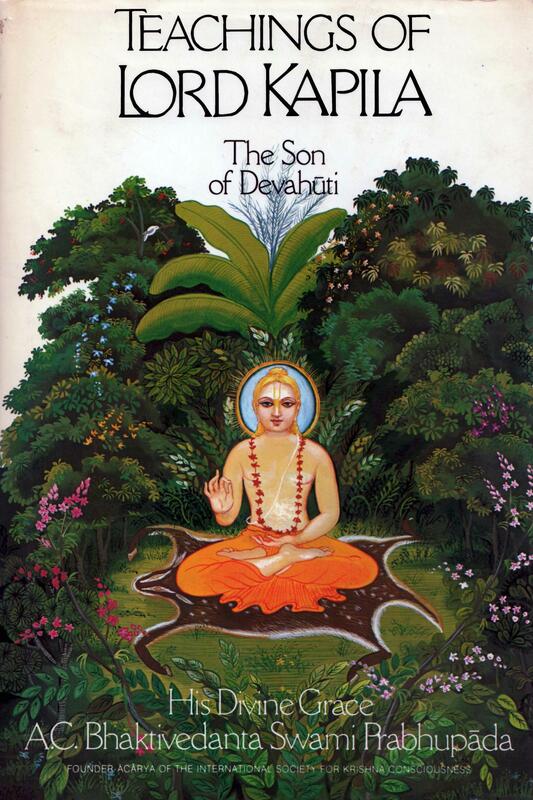 The following is chapter six in our series on the Teaching of Lord Kapila entitled “Devahūti Desires Transcendental Knowledge”. This chapter contains the timeless instructions on receiving spiritual knowledge. It is very difficult to get out of this entanglement and attain freedom, but if one is fortunate enough to get the association of a spiritual master like Kapila Muni or His representative, then by his grace one can be delivered from the mire of ignorance. The spiritual master is therefore worshiped as one who delivers the disciple from the mire of ignorance with the light of the torch of knowledge. 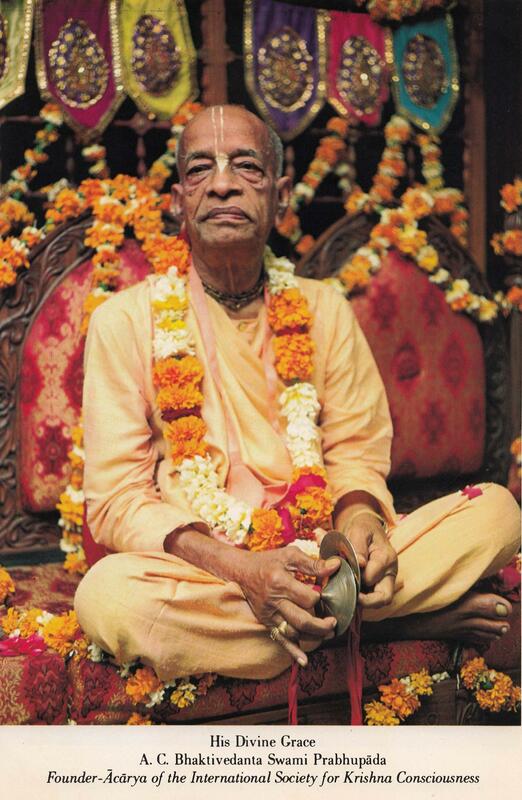 We are fortunate in this age to have the books of His Divine Grace A. C. Bhaktivedanta Swami Prabhupada to guide us. Human knowledge was originally preserved through oral tradition, but today we have this knowledge preserved in the books of His Divine Grace. 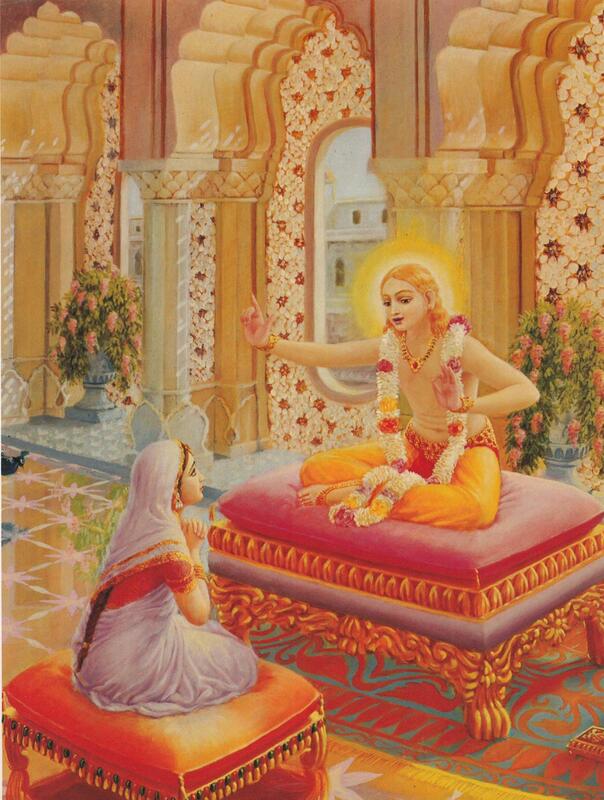 The following is chapter five in our series on the Teaching of Lord Kapila entitled “Lord Kapila Takes Charge of His Mother, Devahūti”. This chapter contains the timeless instructions on receiving spiritual knowledge. We are fortunate in this age to have the books of His Divine Grace A. C. Bhaktivedanta Swami Prabhupada to guide us. Human knowledge was originally preserved through oral tradition, but today we have this knowledge preserved in the books of His Divine Grace. …We can understand the pastimes of the Lord by following one or some of the authorized devotional processes. 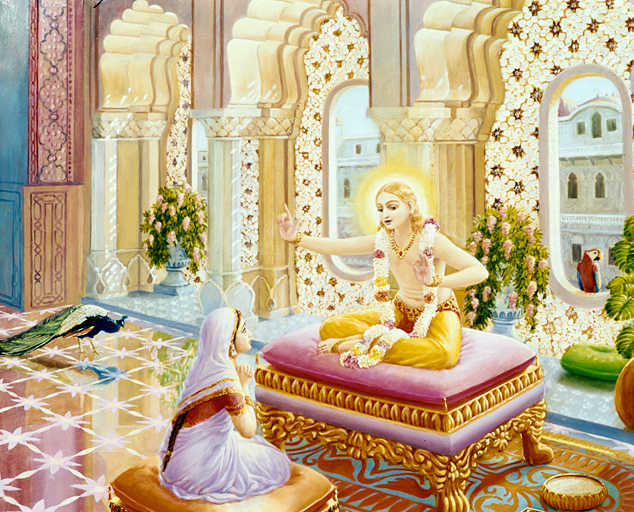 …hearing and chanting, are the beginning of bhakti, devotional service. Therefore it is said: tāni me śraddadhānasya kīrtanyāny anukīrtaya. The word anukīrtaya means to follow the paramparā system… The Supreme Lord is more anxious to give us education and enlightenment than we are to receive them. He gives us His literature, His devotees and the paramparā system, but it is up to us to take advantage of these. The Kṛṣṇa consciousness movement is intended to give society the proper understanding of the Absolute Truth. We are not presenting a manufactured, bogus philosophy. Why should we unnecessarily waste our time concocting some philosophy? There is so much to be learned that has already been given by the supreme authority. All we have to do is take this Vedic literature, try to learn it and distribute it. 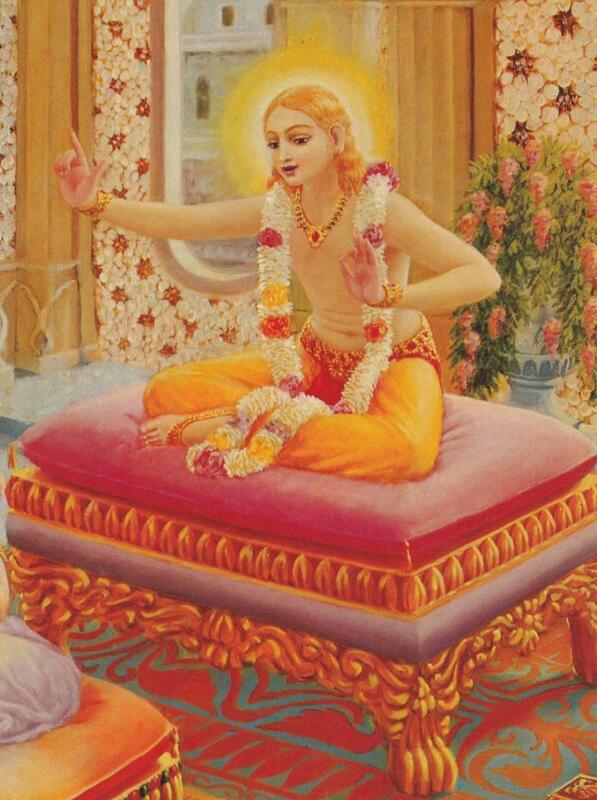 That is Caitanya Mahāprabhu’s mission. 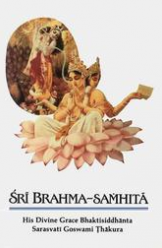 …Anyone who is associated with the Supreme Lord is accepted as a first-class yogī. …people are unaware of the miserable conditions of material life. Kṛṣṇa says in Bhagavad-gītā (13.9), janma-mṛtyu jarā-vyādhi-duḥkha-doṣānudarśanam. Real knowledge means knowing that however great one may be, the four principles of material life are present: birth, old age, disease and death. The Kṛṣṇa consciousness movement is an attempt to make people fortunate. In this age, everyone is unfortunate (manda-bhāgyāḥ), but now we are trying to reverse the situation. …The purpose of this Kṛṣṇa consciousness movement is to inform everyone that no one is superior to Kṛṣṇa, God. Because many young Americans and Europeans are fortunate and know nothing of any hodgepodge god, they have taken this bona fide Kṛṣṇa consciousness movement seriously. Kṛṣṇas tu bhagavān svayam: Bhagavān, God, means Śrī Kṛṣṇa. We have simply presented this information, saying, “Here is God. Śrī Kṛṣṇa.” Because they have taken this seriously, many young Americans and Europeans are advancing in Kṛṣṇa consciousness. Consequently many people are surprised to see how Americans and Europeans have become such great devotees and are dancing in ecstasy. How is it they are so advanced? They have taken the information seriously: kṛṣṇas tu bhagavān svayam. Whether one touches fire blindly or knowingly, fire will burn. It is not that because the fire is touched by a child, fire will not burn. These young Westerners have touched fire, and consequently it is acting as fire. …If we hear about Kṛṣṇa, we become purified. Hearing about Kṛṣṇa means associating with Kṛṣṇa. In this way we may perfect our lives. The word ātma-prajñaptaye indicates that the Lord descends for the benefit of the human race to give transcendental knowledge. Material necessities are quite sufficiently provided for in the knowledge given in the Vedic literatures, which offer a program for good living and gradual elevation to the platform of sattva-guṇa, the mode of goodness. Once one is situated in sattva-guṇa, one’s knowledge expands. On the platform of passion there is no knowledge, for passion is an impetus to enjoy material benefits. On the platform of ignorance there is neither knowledge nor enjoyment but simply animalistic living. In summer we suffer, and in winter we suffer. In the summer, fire brings suffering, and in the winter the same fire is pleasing. 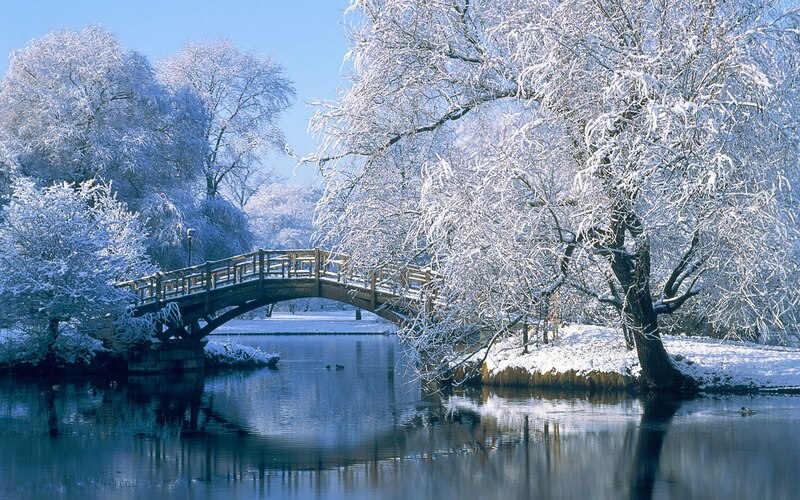 Similarly, in the winter, water is suffering, but in the summer it is pleasing. The water and the fire are the same, but sometimes they are pleasing, sometimes they are not….The more we are in the bodily conception, the more we suffer.